Spring cleaning is the time to shift your winter clothes and summer clothes around and make your room clutter-free. I recommend starting with your closet because there is an endless amount of space that most people do not realize they have and has endless potential. 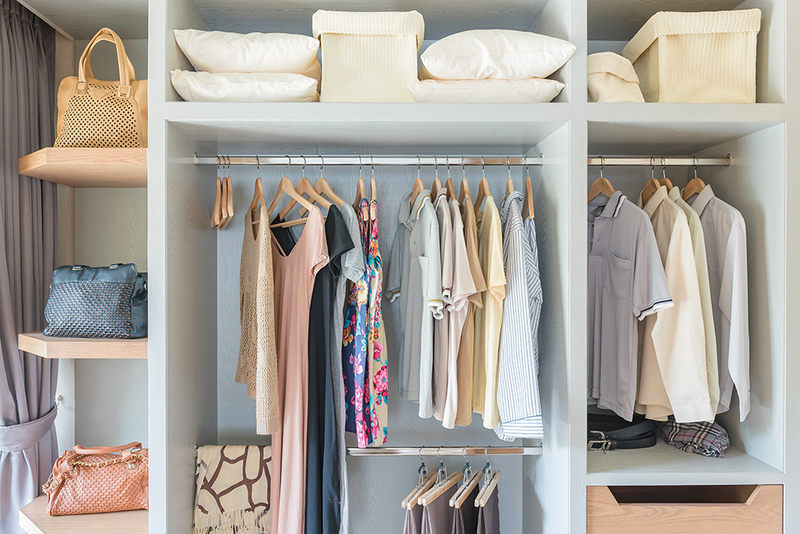 The Local Records Office offers some tips for gaining the most use of your closet space to create the ultimate storage for your rooms’ needs. 1 – Declutter of getting rid of clothes you do not wear. One closet trick is by getting rid of clothing you have not worn in 6 months. Though, when going through your summer stuff and packing up your winter clothes, this rule may not apply to some. Tip: Hang clothes facing towards you and when you wear something, turn the hanger backward (the correct way) and in six months times you will be ready for donating the items of the clothes facing the wrong way. 2 – Dedicate two-thirds of closet space to hanging rods, and to maximize the space, mount one above eye level for longer garments and one a little more than 3 feet off the ground for shorter (foldable) garments and position 1 foot away from the back wall. In case you have more pants, consider a sliding pants rack. 3 – Implement shelves, shelf dividers, underwire baskets, drawers for folded items, hangers for dresses and suits, boxes for odds and ends and hooks for purses. Place smaller things in their place. Designate a container such as a bowl or a bin on a shelf, or even a pouch that hangs inside the door to serve for a catchall for loose change, receipts, or any items that accumulate in your pockets. And coordinate by using the same hangers for a clean look and keep it staying organized. 4 – Store your most used items at eye-level, the less-used items below, and the least-used items up high. 5 – Use an umbrella stand to hold other odd items such as yoga mats. 6 – Use boxes, cubbies, or tiered shelves to sort shoes. 7 – Add lights to your closet to see and guide you so you can find what you are looking for and also makes the closet appear more spacious. 8 – Replace closet doors with hanging screens or curtains and if you have doors, add a closet door shelf to hang things on the closet door like scarves, or shoes. 9 – Make more room in your closet by storing out-of-season clothes in boxes either up high or underneath the bed. 10 – Color-coordinate your clothes to make them easier to find. 11 – Get suitcases or an ottoman you can store in your bedroom is a unique way to store out of season blankets or scarves and/ or sweaters. 12 – Baskets and trays are used to store smaller items, putting up a pegboard organizer and/or hooks can arrange for a catchall for ties, socks, belts and other smaller items. 13 – Vertically dividing your closet will allow you to create more space. 14 – Avoid jumbled piles of folded clothes by limiting shelf stacks to the height of 10 inches and partitioning them with thin bookends, such as Highsmith’s steel versions. 15 – Keeping things off the floor so it makes cleaning easier by only having things that can easily be lifted or rolled away, such as suitcases and everything else should be an inch off of the ground. And in case, you are not exactly the handiest person, consider purchasing a close organizer already made or buying one from Ikea, also if you work from home take a look at these office space hacks. Having the extra space in your closet will make things so much easier to find, will go a long way in making your life whole lot easier. Best of luck to your spring cleaning!